Thought Media is proud to introduce our Canadian website hosting services that are energy efficient! Now you can actively work to reduce your carbon footprint simply by using our green Canadian website hosting services for your website. From construction to operation, our servers use less power and run more efficiently which in turn, makes for a greener globe. Consumers, as well as the tech industry, understand that now that we know more about the damage we do to our planet, that we have to do more as well to rectify the situation. Itâ€™s not enough to recycle in the office. We need to go green in every aspect of our business possible. Our new Canadian web hosting services do just that by harnessing the power of renewable energy sources like wind power. Going green doesn’t mean sacrificing on quality. Built with premium hardware, our servers utilize only the fastest and most reliable networks, giving your customers the lightning fast access they demand each time, every time. We also utilize state-of-the art software that is the best in the field. The only thing you sacrifice with our website hosting in Canada are the greenhouse gases created by other companies. Not only do you receive the feel good karma points for going with green servers, but you could see your profits rise as well. Customers crave being green, and hosting your Canadian companyâ€™s website on green servers can be an attractive selling point. Customers like to feel that they are doing good in the world. Thatâ€™s a feeling you can offer them with no added expense when you host your website on one of our green servers. 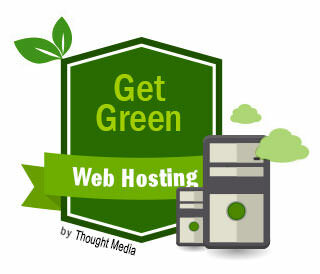 Our new green servers are available to host your website now. We invite you to contact us for a free, no obligations quote for hosting your website. Donâ€™t have a website? No problem! Here at Thought Media, we offer innovative WordPress, Custom, and Ecommerce website designs that get results. Call us for your no obligation needs analysisÂ Â 1 (800) 916 3864,Â orÂ Request Quote.